Do I have to hallmark all gold or silver articles I produce or sell ? No. There are weight exemptions according to the Law. These are below 1.0 g for gold and below 3 grs for silver articles. What will happen if I do not hallmark my articles ? It is against the law to sell unhallmarked articles above the weight exemptions or describe articles as precious metal articles. Competition and Consumer Protection Service or Cyprus Assay Office Officers, have the power to seize any items that do not comply with the Law which can lead to prosecution and a fine of up to €10,000 or imprisonment for 2 years or both. 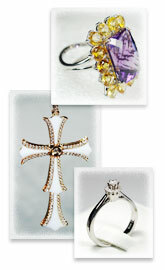 Should I send the articles for hallmarking finished or unfinished? It is acceptable in both ways, however it is preferable to send the articles in unfinished form. If the articles are supposed to be marked by laser, it is preferable to be sent in their prefinished stage. Can I send my gold and silver work for hallmarking on the same hallmarking form? No, each metal and each standard needs to be submitted with its own separate form. Can I apply my sponsor's mark to articles that do not need hallmarking? Yes. You can apply your sponsor's mark to any article that you make or sell which is hallmark exempted. Can I choose where the hallmark is placed on my articles? Usually the Office decides where to place the hallmark according to the article type and the stage of manufacture (unfinished, etc). However, if you have a specific size or place you want the mark placed we suggest that you use a marker to indicate the relative area or/and discuss your requirements with an Officer. If the submitted articles are substandard, what options do I have ? The articles can be hallmarked to next lower standard of fineness or destroyed for remake. If the articles are imported, they can also be given to the owner for re-export to the country of origin. Which are the Gold and Silver standards of finenesses ? for silver: 800°, 830°, 925°, 999°. What is the difference between a sponsor's mark and a logo? A sponsor's mark is a compulsory component of the hallmark and comprises the initials of the sponsor's personal or company name surrounded by a shield design. All sponsors' marks are unique and provided by the Assay Office. The company logo can not be used as a sponsor's mark. Your company logo can be used if you wish - on your articles - either from you or from our high-tech laser during hallmarking. 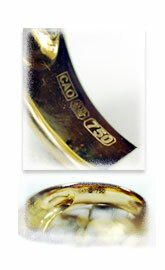 Does the Assay Office provide logo engraving services ? Yes. The Cyprus Assay Office can reproduce any design (with or without text) with Laser technology and engrave it to any flat metal surface. Please click here or contact us for more information. What is a Convention Hallmark? A Convention Hallmark is a type of mark applied by a member country of the Convention (Vienna, 1972). 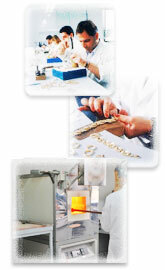 It comprises the sponsor's mark, the common control mark, the fineness mark and the Assay Office mark. The Convention mark (Common Control Mark - CCM) is recognized by all member countries in the International Convention and items do not have to be re-hallmarked. Please follow the relative link for more information. any flat metal surface. Please click here or contact us for more information. Why Nickel use or plating is not permitted ? According to European Regulation (EC) No 1907/2006 concerning the Registration, Evaluation, Authorisation and Restriction of Chemicals (REACH), Nickel use is not permitted in articles coming into direct and prolonged contact with skin. Also the Cyprus Hallmarking Law (N.52/2009) and Vienna Convention permits only Platinum, Rhodium, Gold or Silver plating on precious metal articles. Can I buy second hand articles ? I must submit an application for registering in the Buyers of Second hand articles. The application will be approved only if the Terms and Criteria of Registries are fulfilled. A Certificate will be issued and from this moment, I may legally operate. What are my obligations as a Certified Buyer of Second hand articles ? I must keep a book to record all details and monitor all purchases that I make. (Description and weight of articles, name address, ID number and telephone number of customer). Also I must keep all articles in their original form (unalterable) for a period of ten days. A photo of the articles must be kept for at least one year. What are my obligations as a Certified Buyer for advertising my activities ? I must include in any type of advertisement the official number of License of the Buyers of Second hand articles Registry, which is given in the Certificate. Is there any possibility of CAO to suspend the validity of my Certificate ? Yes. CAO can suspend the validity of my certificate, if I do not implement any of the above mentioned obligations that I have as a Buyer, which arise from the Law. For more information, please contact the Office.